Share your website with the world, for free! GitHub is a great tool to store projects and to collaborate with others, but its usefulness does not stop there. We’ll use a service called GitHub Pages to share our web page creations on the World Wide Web. There are many different ways to deploy a website to the public Internet. We’ll be using GitHub’s free service called GitHub Pages. Deploying is like publishing. When authors are ready for their work to be seen by the world, they publish it. When web developers are ready to share their projects, they deploy to the World Wide Web. Deployment is when a project is packaged and shared on the Internet. Unlike publishing, however, deployment may occur many, many times over the course of a software project. Deploying to GitHub Pages is automatic. Once it’s set up, deploying happens whenever you push your local changes to your remote, GitHub-hosted repository. 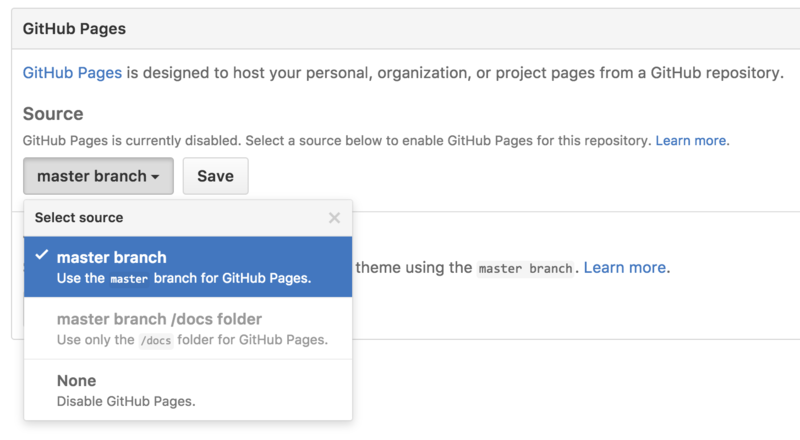 Head to GitHub Pages’ setup instructions and follow the steps exactly to get your main GitHub Pages page setup. When you first navigate to your newly deployed site it is possible that you will receive a 404 error. If this happens, and you are confident that you have followed all the steps as written, check back in 30 minutes to see if the deploy has successfully gone through. That’s it! Your website is deployed to the Internet! You and anyone with whom you share this link can view your project by navigating in your browser to the URL http://<your-github-username>.github.io. You can set up your GitHub Pages to deploy every one of your repositories in addition to <username>.github.io. This will allow you to ensure all of your sites are deployed automatically whenever you push to GitHub. In GitHub, navigate to your <username>.github.io repository and click Settings. Within Settings, navigate to the Source section within the Github Pages section. From the dropdown menu, select master branch and then click Save. Now, all of your repositories can be found at http://<username>.github.io/<repository-name>. Try creating a new repo with an HTML project inside it (perhaps push an old project to GitHub) and then navigate to the deployed page. Now that your GitHub Pages site is set up, deploying new changes is easy. Every time you make a change to your site, use the normal GitHub flow. That is, use git commit and git push to send your changes to GitHub. After this, the GitHub site should update within a few seconds. Just refresh the page in your browser, and you’re good to go! Congratulations on your first live web page!